One of the most promising methods of water purification and distillation is the evaporation method using heat pump energy transformers. The article describes the developed scheme of a heat pump for vacuum distillation, which operates under atmospheric pressure with water at saturation temperatures in the range of 20–40 °C. Results of experimental studies on a specially made installation are presented. The proposed technical solution using a two-lobe Roots type vacuum compressor pump as the basic means of increasing the pressure is shown to be viable. 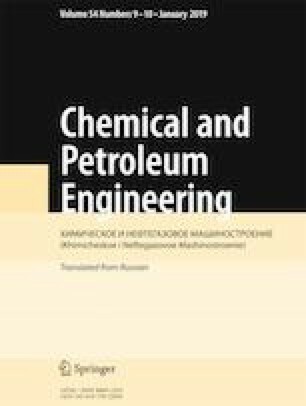 A mathematical description of the unsteady heat and mass exchange process of a single-stage distillation unit with mechanical vapor compression was verified. An equation for calculating the heat transfer coefficient for evaporation of water under vacuum in a free volume on vertical pipes is proposed. Data on the performance and power consumption of the installation were obtained. Translated from Khimicheskoe i Neftegazovoe Mashinostroenie, Vol. 54, No. 9, pp. 24−27, September, 2018.